Bing is quickly becoming my new best friend. 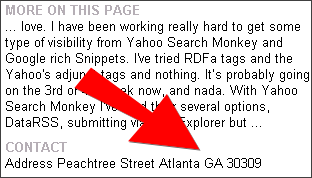 A couple of weeks I blogged about RDFa tags and Rich Snippets and the visibility I was getting from Bing search engine. Well the day after I modified the tags to see if I could learn how to better control the content that is being displayed in the hover description section. Well I just noticed the address was updated so it seems that Bing is actually responsive to my updates. My next goal is to see if I can get my image displayed within that section. I have an RDFa image tag already in place but I must have something wrong because that has not been displayed yet. So I’m going to do some additional research and modify the code a bit when I fine something out. The new information is a great discovery and I’m pretty stoked right now. It’s all about testing your data and not always relying on what you read. Trust yourself first!